Multi Spoke styling to enhance the vision of your Yamaha, Club Car, or EZGO golf cart. 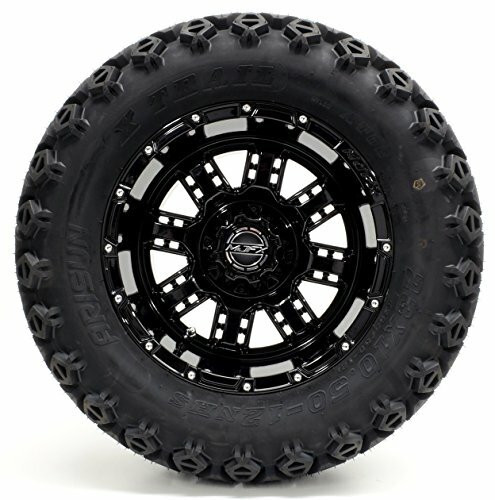 Tire is a 23x10.5-12 6-ply "X-Trail" All-Terrain Tire. Wheel is a 12 x 7 with an offset of 3x4. A lift of 5" or higher is required. NOT RESPONSIBLE FOR MODIFICATIONS THAT MIGHT BE NEEDED. Lug nuts are not included with this assembly. The Center Cap covers the lug nuts completely. You will reuse your existing lug nuts. Tools Needed: Socket Set and Jack!